Another Biotech Winner? Please And Thank You. This is a Post from the Symbol Surfing Blog from Fri, Aug 17, 2018. I have been able to make a couple good trades in biotech stocks this year with BIIB and BMY. 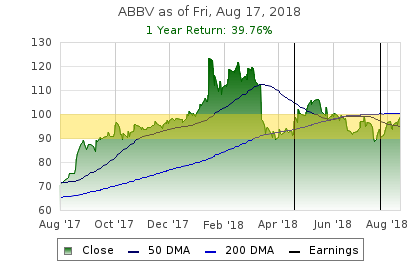 Another one that looks good right now is Abbvie. Abbvie originated as a spin-off of Abbott Laboratories. This is a $150 billion market cap biotech stock that pays almost 4% in annual dividend yield. Also, their P/E Ratio is in the low 20s. "We’re still committed to be able to return significant capital to shareholders," the company’s CEO, Richard Gonzalez, said during the second-quarter earnings call in late July, adding that "we have the ability to continue to grow the dividend." On the 1-year stock chart, I have highlighted the trading range between $90 and $100. It would be great if the stock continues the post-earnings rally. I wish I bought a couple days ago, but now I have seen more of a stronger confirmation on the stock price movement. Obviously, I am hoping the stock price breaks through the resistance at $100 and heads back to previous highs. On the downside, it looks like there is a lot of support at $90. In that case, I would be ok waiting while receiving the dividend. Either way, I like this trade. << Can You Profit From The 2019 National Defense Authorization Act?